This tweet from Associated Press is like the journalistic version of that Worst Twerk Fail video. AP tweeted this under false pretenses. For those of you who know the actual facts, you can see what they did there. It’s largely another bit of journalistic malpractice, because the attempt at a hyper-shocking “headline” in the form of a tweet bears no resemblance to the facts contained within the full story. Like the rest of the liberal mainstream media, they’re just advancing the ongoing false narrative about the George Zimmerman story. They still haven’t gotten over the fact that he was found not guilty. They so wanted him to be guilty. They invested tons of airtime and ink to this effort. Apparently they’re still doing it. Note that this tweet (and CNN’s coverage all evening yesterday and today, so far) comes AFTER the real facts (as opposed to what they want them to be) have been out there for quite some time. And what they’re reporting in headline form is not reality. It’s their false narrative. Nothing is new here. This is not breaking news. By which I mean my story about the media blowing smoke to push their own agenda — is not news. For an example of the real facts, here’s an ABC News article, written well before that above tweet, at about 10:05 PM yesterday, Florida time, and updated this morning (my emphases). I can only imagine how painful it must have been for them to report this. LAKE MARY, Fla – Lake Mary Police are now questioning the validity of several statements Shellie Zimmerman made when she told 911 dispatchers her estranged husband, George Zimmerman, threatened her and her father at gunpoint Monday afternoon. … Hudson told ABC Action News Shellie provided a written statement Monday night saying she never saw a gun and only assumed her estranged husband was carrying a weapon because he touched his stomach. … According to authorities, Shellie’s father did not have any visible injuries. In the 911 call, Shellie asked the dispatcher to send paramedics because her father’s nose looked like it was broken. There are also other inconsistencies police pointed to on the 911. Shellie told dispatchers that officers arrived and had their guns drawn. She said George was sitting in his car. Fearing George would start shooting, she told the dispatcher her and her father were going inside. According to police, George was not in his car when they arrived but was standing in the yard. They say he was also very cooperative and allowed police to search his person. Watching CNN and CNN’s Headline News (HLN), or reading CNN’s Nancy Grace’s tweets after she’d obviously learned the facts, betray her and their disappointment about the real story coming to light. It was like watching an Olympic athlete collapse, deflated, after coming in a close fourth in the marathon. They all seem really upset that George Zimmerman didn’t get caught trying to shoot his wife and her father dead. Zimmerman’s not white, he’s Hispanic, but for the first time in history, he was described in the media as a “white Hispanic.” In other words, close enough. They’re pushing an agenda. 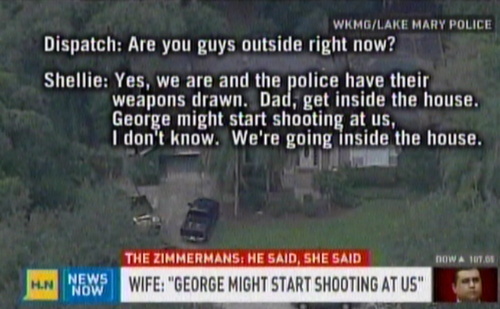 Get George Zimmerman. Why? The liberal-left and their media division like to push the narrative that there is still rampant racism in America. That empowers them for a number of political reasons, manifestly that it gets out the black vote, which overwhelmingly (but irrationally) votes left. And this story fits the bill perfectly: a “white” man killed a black “boy” just willy-nilly, because… racism. The story also fits their rabid anti-gun and gun control narratives just perfectly. Which again fills their yearning to express their left-wing world view, and advance the progressive movement. That is the liberal mainstream media agenda. I’d rather watch Miley Cyrus twerk, and that made me sick. But there’s something even better: did you see that viral “Worst twerk fail” YouTube video that turned out to be an ingenious Jimmy Kimmel-produced fake? That’s a lot like the mainstream media’s failed twerk of this Zimmerman story.